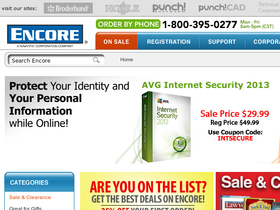 Encore Software, online at encore.com, is a leader in offering educational software and entertainment. Encore Software offers a wide range of software for kids and adults in areas like math, learning, home and landscaping software, games, legals solutions, lifestyle software, and more. Encore Software offers popular titles, including Mavis Beacon Teaches Typing, Math Advantage, Middle School Advantage, Hoyle Card Games, FormTool Professional, and many others. Encore.com is a great learning and entertainment resource for people of all ages. But before you shop, get all the latest encore.com discounts, Encore Software promotions, and Encore Software coupon codes found here at RetailSteal.com. Encore ships within the United States and Canada. Shipping rates are based on shipping method and destination. See site for more information. Shop at Encore Software and enjoy 25% savings on all orders with this code. Enjoy free shipping on Mac and PC software from Encore.com. Click here and use coupon code on orders $30+ to enjoy discount. Save 20% on all orders at Encore Software. Click here and use limited time coupon code. Use this code at Encore Software and enjoy a 30% discount on All Professor Teaches Software. Save 35% on your entire order from Encore Software plus get free shipping when you use this coupon code online. Receive 30% savings on Encore software this summer when you use our coupon code online. Click our link to shop. Use this code at Encore Software and save $30 on your purchase of Cooking Recipe Organizer V11 today. Enjoy $15 savings Family Tree Heritage Platinum 9 from Encore Software when you use this coupon code online. Sign up for an email subscription at encore.com and save 25% off your first order. Purchase the PaperPort 14 software at encore.com and save $80 when using our coupon code at checkout. Click here for code. Shop at encore.com and save $130 on the OmniPage18 software. Click here for code.